Gabrielle Giffords' Resignation Message A Reminder Of Gains, Losses : It's All Politics From her public appearances, including her resignation video, it was clear that Giffords, even as a powerful symbol of the strength of human will and the advances in trauma medicine, would face significant challenges in dealing with the rigors of a re-election campaign. So her decision, though a sad reminder of what has been taken from her, was not a surprise. 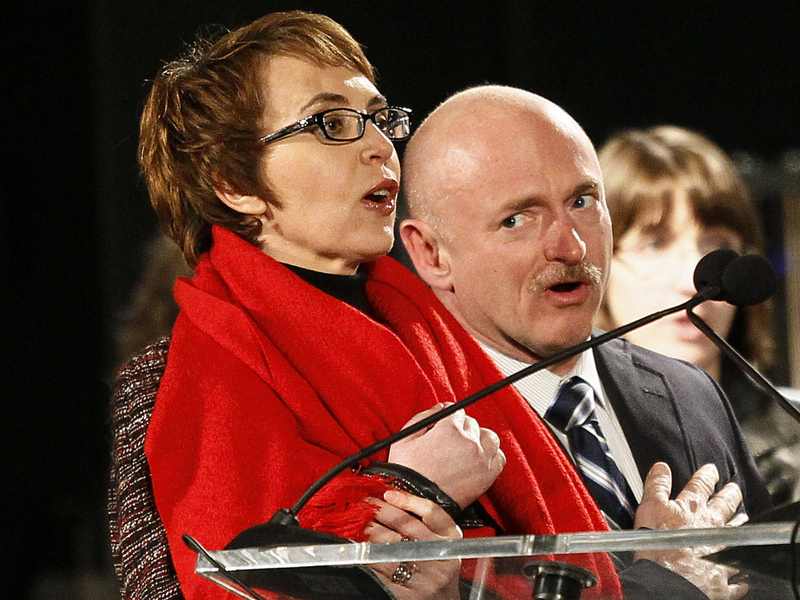 Rep. Gabrielle Giffords, with her husband, Mark Kelly, leads the Pledge of Allegiance at a Jan. 8 service to remember the Tuscon shooting victims. The name of the Democratic congresswoman from Arizona will forever be associated with one of the most tragic attacks on a member of Congress, the shootings in Tucson last year that killed six and left 13 wounded, including the congresswoman. Her name will also be linked to one of most astonishing medical recoveries, followed by millions of people worldwide, from a grievous gunshot wound to the head. And now, as of Sunday, Giffords' name will be tied to one of the most memorable announcements of a congressional resignation. In a two-minute video, Giffords told her constituents that she would be leaving Congress this week to focus her energies on her continued recovery. The very fact that she could make the video was testament to how far she had come since last January when she was shot. But the video was also a reminder of how much she has lost. The congresswoman spoke with the deliberateness of someone who had to relearn what most of us take for granted — how to speak. "I have more work to do on my recovery. So to do what is best for Arizona, I will step down this week... I'm getting better ... Everyday my spirit is high ... I will return." From her public appearances, including her resignation video, it was clear that Giffords, even as a powerful symbol of the strength of human will and the advances in trauma medicine, would face significant challenges in dealing with the rigors of a re-election campaign. So her decision, though a sad reminder of what has been taken from her, was not a surprise. Before the announcement of her resignation, there was speculation that if she stepped down, her husband, astronaut Mark Kelly, might run to succeed her. "Giffords' resignation will force a special election to fill her seat in the 8th Congressional District. "Republican candidates state Sen. Frank Antenori, R-Tucson, and Dave Sitton, a University of Arizona sports broadcaster, already had formed exploratory committees for the November general election to test the waters for a possible run in her district. Jesse Kelly, Giffords' 2010 GOP opponent also might run again. Republican Adam Hansen of Bisbee also has announced his candidacy. "On the Democratic side, state legislators Paula Aboud, Steve Farley and Matt Heinz of Tucson have been mentioned as possible Giffords replacements. Mark Kelly, Giffords' retired astronaut husband, Pia Carusone, her congressional chief of staff, and Ron Barber, her state director, also have been mentioned as possibilities, although Kelly particularly has indicated he isn't interested in running." The shooting of Giffords and 18 others so shocked the nation's conscience that it became the impetus for efforts that proved fleeting to bridge the partisan divide in Washington. Many Democratic and Republican lawmakers took the unusual step of sitting next to each other at last year's State of the Union address by President Obama. A similar bipartisan date-night is planned for this year's SOTU Tuesday evening. When Giffords' recovery reached a point that allowed her in August to return to the floor of Congress for the first time since her injury, it came amid a time when partisan bitterness in Washington, D.C., was boiling over in the fight to raise the federal debt ceiling. The joy caused by her unannounced visit was about the only thing on which Republicans and Democrats could agree. They could also agree, on her resignation from Congress, that she had come to stand for something that stood apart from the political trench warfare of modern Washington. "Gabby Giffords embodies the very best of what public service should be. She's universally admired for qualities that transcend party or ideology – a dedication to fairness, a willingness to listen to different ideas, and a tireless commitment to the work of perfecting our union. That's why the people of Arizona chose Gabby – to speak and fight and stand up for them. That's what brought her to a supermarket in Tucson last year – so she could carry their hopes and concerns to Washington. And we know it is with the best interests of her constituents in mind that Gabby has made the tough decision to step down from Congress. "Over the last year, Gabby and her husband Mark have taught us the true meaning of hope in the face of despair, determination in the face of incredible odds, and now – even after she's come so far – Gabby shows us what it means to be selfless as well. "Gabby's cheerful presence will be missed in Washington. But she will remain an inspiration to all whose lives she touched – myself included. And I'm confident that we haven't seen the last of this extraordinary American." "I salute Congresswoman Giffords for her service, and for the courage and perseverance she has shown in the face of tragedy. She will be missed."